Most of us in the model railroading hobby catch the bug after starting out with a basic circle or oval track configuration. But, after watching the trains go round… and around… and around a few thousand times, we start to lose interest in what is a really terrific hobby. It shouldn’t be like that! And, if you’ve reached that stage, then it’s time to start planning a more interesting and more functional track layout – one that will not only keep you interested for hours on end, but also entertain and enthrall visitors to your model railroad. It’s time to plan and construct the ultimate model railroad… the one you always dreamed of having, but didn’t know quite where to start. BUT WAIT!!! The “starting off” part is generally the most crucial stage of the entire process. It’s the point when numerous mistakes can occur. Fortunately a few of these errors are able to be fixed later and are simply part of the learning process, but other mistakes during the planning stage will be serious and can pose continual and longer term problems. They might not only affect the realism of your railroad, but also affect how smoothly and reliably it operates. What’s the point in investing time, effort and loads of money constructing what you imagined was to be the ultimate railroad layout, only to finish up changing it or beginning over again? Now, don’t get me wrong; there’s nothing wrong in making progressive changes for the better and expanding your layout as and when you develop new skills. That’s what most model railroaders do – their railroad grows as they grow their skills. That’s very different than always “chasing your tail”, or constantly “putting out fires” due to poor planning and avoidable mistakes. Therein lies the problem; if you haven’t been involved in track planning before how on earth do you know what works and what doesn’t? Ideas for your dream railroad might look good on paper, but might turn out to be totally impractical when translated in actual scenery and track. Model railroading is a vast subject and that’s one of the things that make it such an interesting hobby. With so many aspects to the hobby, it also means there’s a lot to learn… and, to progress, you’ll never stop learning. That’s why this free report focuses on just one area (a very critical area) of the hobby. 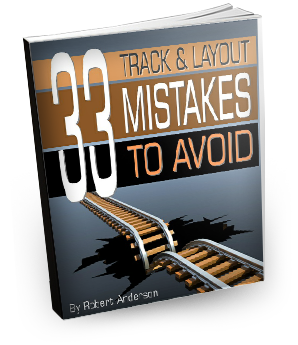 This free report won’t focus on selecting and building a track plan. Instead it focuses on logically thinking about what makes most sense to best utilize the layout room to give you the most advantage. Designing workable track plans comes with experience by learning from mistakes you make along the way, and from the mistakes others have made. Obviously it makes sense to minimize or eliminate your own errors and to try and avoid expensive mishaps. That’s why learning from others who have walked the same path can be invaluable. Why commit to the same frustrating and costly mistakes others made before you? Repeating the mistakes others have made many times before is not god use of your resources. So, that’s what this free report is all about. It will hopefully alert you to potential problems that can be avoided before they happen. Naturally every layout, every person, and every situation is different, however most model railroaders encounter similar challenges regardless of the scale, brand of trains, or operating systems employed. Model railroading problems are not usually unique to just one person or one railroad. So, there’s no advantage in striving to be the first to encounter a particular problem, when others have probably already found the solution. There is enough to do constructing and operating a model railroad without wasting valuable time and money patching problems that could have been avoided in the first place. Hopefully, with some advance knowledge you will be in a position to pin point likely planning mistakes or trouble spots well in advance. Do that, and you’ll have more time running your trains, and doing the model railroading things you most enjoy. TO GET STARTED. PLEASE READ THIS PAGE CAREFULLY. The file to download is below in the red box. Simply "Right Mouse Click" on the file and a MENU like the one on the right will open up. Once you select "SAVE TARGET AS" or "SAVE LINK AS" a download screen will appear asking where you want to save the file to on your computer. You can save the file anywhere you like...BUT, you'll need to remember WHERE you saved it. So choose to save it to your "DESKTOP" or in a special folder you created, so that you'll know where it is. After you have downloaded the file, go to your "DESKTOP" (or the folder you saved it to) and DOUBLE CLICK the file to open. You can then print them out. Download time will vary from computer to computer depending on your internet speed at the time. © Copyright. 2015 modelrailroadhub.com All Rights Reserved.